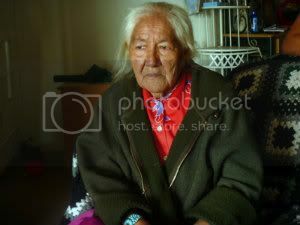 I am an elderly woman living in a 1-room eight-sided juniper Hogan (house) without running water and electricity. I am a great grandmother and have 5 children and numerous grandkids. I live a traditional subsistence lifestyle herding sheep, weaving traditional rugs and am an herbalist specializing in remedies for the stomach. I sleep on a cot over a dirt floor next to a wood fire built within an overturned, sawed-off barrel. I wake each morning before dawn and make a small white-corn pollen offering and to pray in the direction of the rising sun. I do not speak, read or write English and am communicating with the help of my daughter who is translating my words. Both my son and daughter are dialysis patients that are going for hemodialysis treatment. In order to get water, I have to carry buckets of water from the Canyon or travel over 50 miles round trip to Hardrock Chapter to get water. Rough dirt roads causes a lot of vehicle problems and I am often without a working vehicle and without access to water. Having a safe drinking water system will allow me access to basic sanitation and make my life easier. Lord, that's something! You read that and nothing one has experienced lately seems worth worrying about. We are all so extremely fortunate -- it boggles the mind, you know? Same country but lives that are unquestionably extremely divergent. Even the "why" stops on one's lips. Thank you Theresa for finding this wonderful organization. 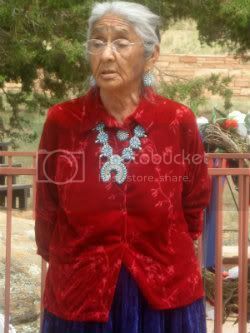 We are traditional Navajo elders living in a 2-room house without running water and electricity near Peabody Coal Company. We do not speak, read or write English and live a subsistence lifestyle herding sheep. I am in a wheelchair and my husband has a heart condition. We were born here in Black Mesa. Our family has been living here for 8 or 9 generations. We see people are having a hard time with uranium exposure and uranium workers are dying. Now the coal miners are all dying off. The retirees are getting diagnosed with Black Lung and Silicosis and are dying off. The water wells near me are capped off and we are told the water is contaminated with uranium and arsenic. Now, we have to go elsewhere to look for water for our use and our animals. Our main concern is, almost every house here are people are of old age. Having a safe drinking water system will make our lives easier and enable us to remain at home. Just cannot believe people live this way in the 21st century and not in a third world country.Thank you for choosing this wonderful charity Theresa, really hope we can make a difference. By the way, these stories I'm posting are not just representative of the people our donations will be helping...these ARE the people that will get water systems due to Zoners' generosity. So think of it this way--for each $1500 that we raise for Project Pueblo, we will be affecting the people that are pictured here. Our donations will be tools in the hands of the volunteers to bring these families fresh, clean water. These stories are so amazing! Thanks Theresa and PtP for bringing this to our attention and for choosing it for the birthday project. Thanks Theresa for all the information and adding the vids and pictures makes it even more real than just reading text. I hope this birthday project raises as much as possible to help all these people, it's hard to imagine having to live the way they have to due to lack of government help. It's just as well charities exist and all the volunteers that are willing to help as much as they can without thought to any kind of reward. 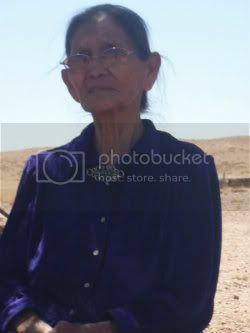 I am elderly and was born and raised on top of Black Mesa in a 1-room house without running water and electricity. The area I live in is called Horse Corral Point and Look Out for Horses Point, Water Chimney, above the route of Peabody Coal Company’s coal slurry pipeline. The US Department of the Interior’s Bureau of Indian Affairs (BIA) capped off and dismantled the windmills near where we live. Recently we were told the reason is because the water sources are contaminated with uranium and arsenic. Just to get to the highway we have to travel 17 miles on rough dirt roads, since we live on a mountain top. We are really having a hard time and going through a lot of hardship as a result of mining and land issue. The rain is disappearing, what happened to our rainfall? I believe it is because Peabody Coal Company depleted so much of our aquifer and there is no magnetism between the earth and sky to make rain. We are thirsty and we do not have any water. I have a heart condition. Having hot and cold running water from a hauled water system will help me greatly. Wow. And this is a person we are helping. What a thing to hear her words and her experience: 17 miles to the highway, water that is poisoned. This fills me with great emotion. We are both lucky I think. She because well, finally something is about to change. But we are lucky too -- not often can one see the direct result of sharing resources. Truly an extraordinary experience. 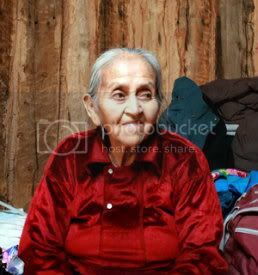 I am an elderly woman living in Box Springs in a 1-room house without electricity and running water. As far as health wise, I need a lot of help. I was diagnosed with intestinal cancer and had part of my intestine removed. I have been drinking water from Box Springs for about 40 years. I am a concerned water user that wants to learn, now that I have cancer and this is reality so I can understand why I was never informed and educated about the danger of drinking contaminated water. I wonder who is next in line for cancer and who else has cancer? Now that the cancer I have is real, it is a wake-up call to my mind thinking of my family, children and grandchildren, who is next in line for cancer and who else has cancer? That is why I am speaking out for my people. I believe if I have a safe drinking water system with a kitchen sink with hot and cold running water from a hauled water system, I will be in good health. I appreciate all the help I am getting since there isn’t much help from any other source. Since Forgotten People has been helping me, my health has been better. If I get a safe drinking water systems I will be in good health. Thank you Theresa for sharing these stories with us and letting us get to know these proud people. They live without having the most basic necessities that most people take for granted; yet they do so with dignity and grace while maintaining their traditions. It is without a doubt an inspiration to read these life stories and hopefully they will receive the things they need to make their lives so much better than they are now. So, Pauline, Alice, and Rena are now definitely getting water systems? What an honor to be a part of the effort. Thanks, Theresa, for letting us get acquainted with them personally. magpie wrote: So, Pauline, Alice, and Rena are now definitely getting water systems? What an honor to be a part of the effort. Thanks, Theresa, for letting us get acquainted with them personally. 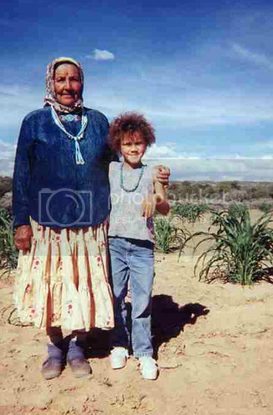 There is one more older couple that I didn't get added to the list...Project Pueblo and their partners, Forgotten People, had identified five families to try and get water systems put at their homes. I'll add the fifth one so we can see all the people that our donations will touch. We live in an old 1-room male Hogan (house) without running water and electricity on top of Black Mesa above Peabody Coal Company’s coal slurry pipeline. We worry all the time about how they will survive without access to safe drinking water. Burt has a heart condition. Our houses have deteriorated and we are trying to make our lives going but it is hard. I have seen a change in the lives of the people. We used to have a lot of people living on Black Mesa that relocated. They are not there anymore. A lot of them died. Relocation is horrible. It causes a loss of culture, turns into sickness because we do not have any more relatives. They died when they relocated. People that relocated lost their mind and soul and die. We are holding on. Having a safe drinking water system will make our lives easier and give us hope.